One of 2012's surprise hit shows in London was Yayoi Kusama's retrospective at Tate Modern. Partly, it was that the work was so good -- playful, hyper-real, immersive pieces showing the artist's complete commitment to her aesthetic over some six decades. But there was also a feeling that Kusama's story was almost too enticing to be true. Born in rural Japan before leaving the country and working her way to the heart of New York's avant-garde, she rubbed shoulders with the likes of Andy Warhol and Claes Oldenburg. She became an artist who prefigured and encouraged significant post-war schools of art from surrealism and conceptualism to pop art and abstract expressionism. Throughout much of this, various mental health issues reportedly left her living under voluntary admission in a psychiatric hospital since 1977. The common art world narrative would now rue an artist who was underappreciated in her own time and died in obscurity. But Kusama bucked that stereotype -- not only was her market value extremely strong (2008 saw Christie's New York sell her 1959 work No. 2 from the "Infinity Net" series for almost 6 million dollars, almost double its guide price, but she was still alive, still working and as creative as ever. With a whole new generation having discovered her through the Tate show, Kusama returns this month with a new exhibition at Victoria Miro. The main gallery is showing new paintings and large scale pumpkin mosaics, while major new bronze sculptures are on show in the gallery's water garden. 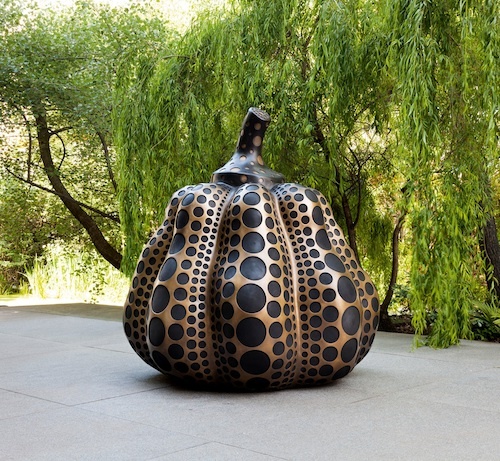 This is the first time that Kusama has worked with bronze at this scale, although the pumpkin motif -- her family made their living cultivating plant seeds -- appears in her work as early as 1948 and has reoccurred in numerous different media throughout her career. Kusama has her own surprisingly earthy explanation for what draws her back to these great gourds: '"Pumpkin head" was an epithet used to disparage ugly, ignorant men, and the phrase "Put eyes and a nose on a pumpkin" evoked a pudgy and unattractive woman. It seems that pumpkins do not inspire much respect. But I was enchanted by their charming and winsome form. What appealed to me most was the pumpkin's generous unpretentiousness. That and its solid spiritual base." 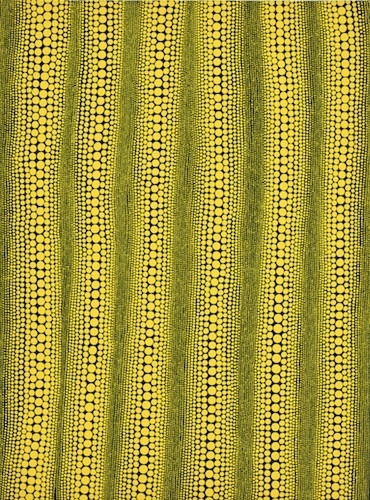 "Yayoi Kusama, Pumpkins" is at Victoria Miro in London. "Paintings & Sculptures" is on view through October 4, 2014. "Bronze Sculptures" is on view through December 19, 2014. 1. Yayoi Kusama. "Pumpkin (L)," 2014 Bronze 220x260x260cm 865/8x1023/8x1023/8in Edition of 8 plus 2 APs (#1/8). Courtesy Yayoi Kusama Studio Inc., Ota Fine Arts, Tokyo / Singapore and Victoria Miro, London. © Yayoi Kusama. 2. Yayoi Kusama. INFINITY-DOTS [KPX], 2014 Acrylic on canvas 130.3 x 97 cm 51 1/4 x 38 1/4 in (KUSA 952). Courtesy Yayoi Kusama Studio Inc., Ota Fine Arts, Tokyo / Singapore and Victoria Miro, London. © Yayoi Kusama. 3. 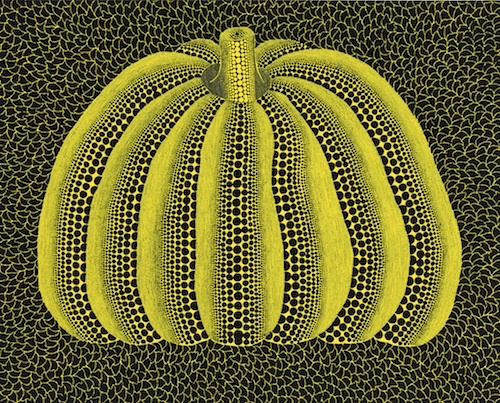 Yayoi Kusama PUMPKIN [KUER], 2013 Acrylic on canvas 130.3 x 162 cm 51 1/4 x 63 3/4 in (KUSA 944). 4. 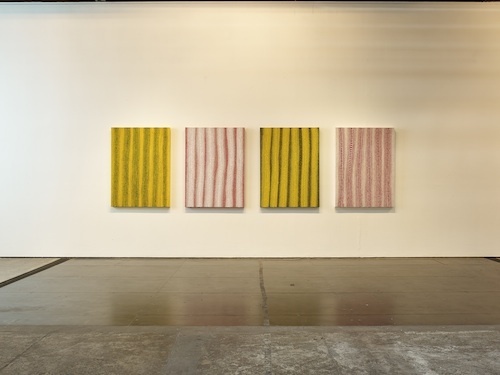 Installation view of "Yayoi Kusama Pumpkins" at Victoria Miro. --Justin Quirk is contributor to ARTPHAIRE. He is a journalist and editor based in London, England. He is editorial director of House, the Soho House Group's quarterly culture journal, and also of Victor, Hasselblad's photographic biannual. He writes features for The Guardian and Sunday Times newspapers, Wallpaper* magazine and Phaidon's Agenda site. When not working he mentors young creatives at The Cut, he writes graphic novels and curates exhibitions for the Canadian artist Nathan James.